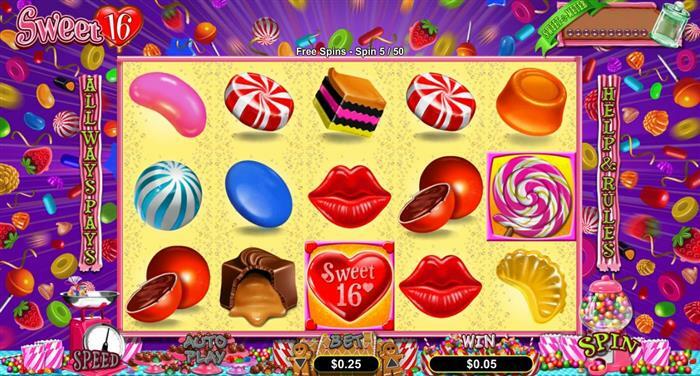 Sweet 16 online slot is a 5 reel, 243 payline slot powered by RTG. The reels are set in a candy store, surrounded with colorful party balloons. They will be spinning to the sound of cheerful, sweet music tune and deliver as many sweets as you can handle. Sweet 16 comes with a creative execution of collapsing reels feature. When symbols participate in a winning combination, they will morph as soon as the corresponding win amount has been paid out. New icons will appear in their place to potential award additional wins. As long as you keep winning, candies will continue paying out and morphing on.